On Wednesday, at GMT 1:30 p.m., the US Census Bureau will release the Building Permits figure, which is an annualized number of new building permits for the residential housing sector issued during the last month. Since getting a building permit usually indicate future construction work, binary options investors consider this data to be a leading indicator of the overall economic activity in the country. Last month, 1.16 million building permits were issued and this month, analysts are expecting the figure to come out around 1.16 million. Since the start of November, the AUD/USD has remained very bullish. However, the uptrend was capped around the resistance level at 0.7350 by the end of November. 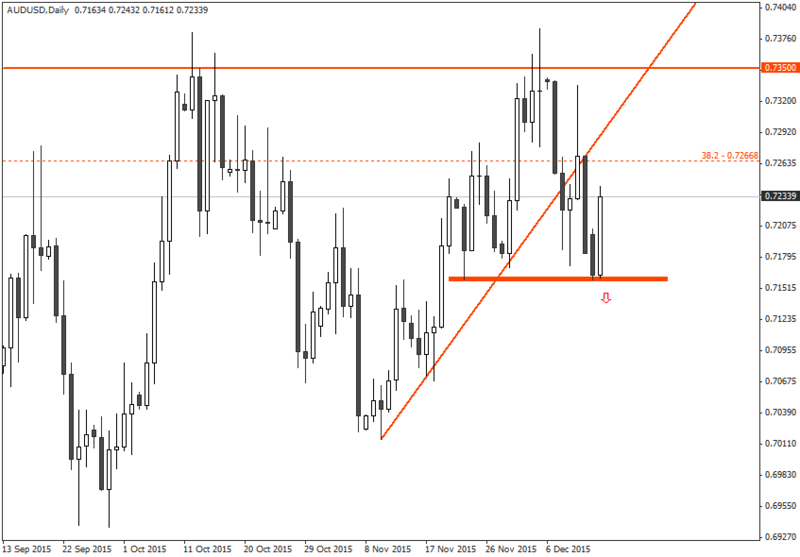 Last week, the AUD/USD price penetrated and closed below the uptrend line generated in November. Although the AUD/USD price immediately started a retracement, soon it resumed the downtrend. Currently, the minor support zone around 0.7160 is holding the AUD/USD price from going further down. Under the circumstances, it is recommended that traders consider placing a PUT order for the AUD/USD with their binary options brokers once the price penetrates and closes below the support around the 0.7160. IQ Option is one of the most trusted and popular binary options platform nowadays for traders. Check out our IQ Option review.